The original post by Jacob G. Hornberger may be found on The Future of Freedom Foundation blog. Republished with permission. Once upon a time, some conservatives used to call for the abolition of the U.S. Department of Education. Lamentably, conservatives today celebrate when a “free-market advocate” like multimillionaire Betsy DeVos is appointed U.S. Secretary of Education, and they get terribly excited when she speaks at conservative conferences. Meanwhile, even while conservatives continue to pronounce their allegiance to their favorite mantra — “free enterprise, private property, limited government” — they continue to embrace not only public schooling itself but also their favorite public-schooling fix-it program, school vouchers. Over the years, conservatives have developed various labels for their voucher program: a “free-market approach to education,” “free enterprise in education,” or “school choice.” They have chosen those labels to make themselves and their supporters feel good about supporting vouchers. But the labeling has always been false and fraudulent. Vouchers are nothing more than a socialist program, no different in principle from public schooling itself. The term “free enterprise” means a system in which a private enterprise is free of government control or interference. That’s what distinguishes it from a socialist system, which connotes government control and interference with the enterprise. A voucher system entails the government taxing people and then using the money to provide vouchers to people, which they can then redeem at government-approved private schools. Does that sound like a system that is free from government control or interference? In reality, it’s no different in principle from food stamps, farm subsidies, Social Security, or any other welfare-state program. The government is using force to take money from Peter and giving it to Paul. That’s not “free enterprise.” That’s the opposite of free enterprise. Conservatives say that their voucher system is based on “choice” because the voucher provides recipients with “choices.” But doesn’t the same principle apply to recipients of food stamps, farm subsidies, Social Security, and other socialist programs? Sure, the recipient of the loot has more choices because he has more money at his disposal. But let’s not forget that the person from whom the money was forcibly taken has been deprived of choices. After all, after a robber commits his dirty deed, he too has more choices with the money he has acquired. His victim, on the other hand, has been deprived of choices. In FFF’s first year of operation, 1990, I wrote an article entitled “Letting Go of Socialism,” in which I pointed out that school vouchers were just another socialist scheme, one that was intended to make public schooling work more efficiently. Imagine my surprise to receive a critique from none other than Milton Friedman, the Nobel Prize-winning economist who is the father of the school voucher program. Friedman leveled his critique in a speech he delivered that was entitled “Say No to Intolerance,” in which he took to task such libertarian stalwarts as Ludwig von Mises and Ayn Rand for adhering to principle. Interesting enough, Friedman’s speech was recently reprinted in an issue of the Hoover Digest, a premier conservative publication. You can read it here. But am I a statist, as I have been labeled by a number of libertarians, because some thirty years ago I suggested the use of educational vouchers as a way of easing the transition? Is that, and I quote Hornberger again, “simply a futile attempt to make socialism work more efficiently”? I don’t believe it. I don’t believe that you can simply say what the ideal is. This is what I mean by the utopian strand in libertarianism. You can-not simply describe the utopian solution, and leave it to somebody else how we get from here to there. That’s not only a practical problem. It’s a problem of the responsibilities that we have. 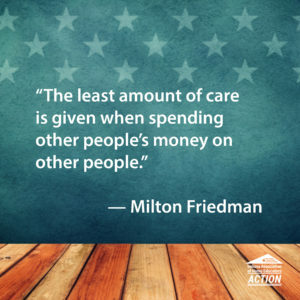 With all due respect to a Nobel Prize winner and a true gentleman, Milton Friedman was wrong on education then, and conservatives who continue to support vouchers are wrong today. Notice something important, a point that conservatives have long forgotten: Friedman justified vouchers as a way to get rid of public schooling. For him, vouchers were a “transition” device — i.e., a way to get from here to there, with “there” being the end of public schooling. That’s not what conservatives say today. They justify vouchers by saying that they will improve, not destroy, the public-schooling system. I can’t help but wonder what Friedman would say about that if he were still alive, given that his support of vouchers was based on the notion that it would serve as a way to get rid of public schooling. Would he still support vouchers if he knew that they would save public schooling and make it more efficient? Why did conservatives end up rejecting Friedman’s justification? They came to the realization that some people would be less likely to support vouchers if they were told that their real purpose was to destroy public schooling. Therefore, to get more people to support vouchers, conservatives shifted Friedman’s justification to the exact opposite of what Friedman was saying. Conservatives began telling people that vouchers, by providing “competition,” would improve the public-schooling system. In fact, voucher proponents today, when pressed, will openly tell people that they are opposed to abolishing public schooling but only want to make it better by providing people with the means (vouchers) to leave the public-schooling system. Almost 30 years after Friedman leveled his critique at me, there is not one instance of where his system of school vouchers have served as a “transition” to educational liberty. Time has confirmed the point I pointed out almost three decades ago — that school vouchers, no matter how they are labeled, are nothing more than a socialistic program designed to make socialism (i.e., public schooling) work more efficiently. 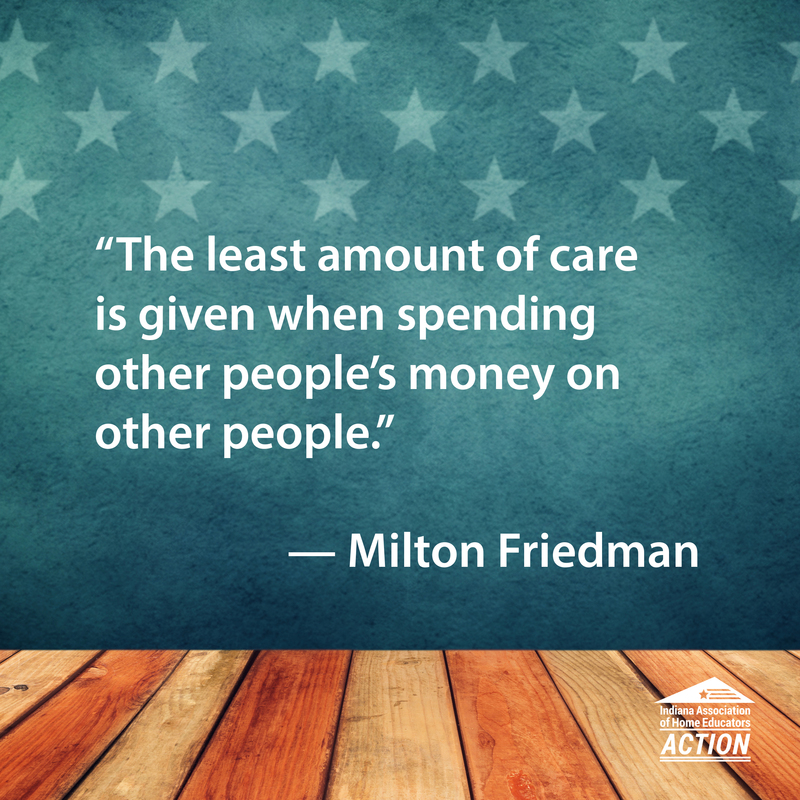 Friedman and conservatives have been proven wrong on education. There is only one solution to the educational morass in which Americans find themselves: Separate school and state, just as our ancestors separated church and state. Repeal all school compulsory-attendance laws and school taxes and sell off the school buildings. End all government involvement in education, including licensing of schools. Establish a total free-market educational system. For more information on this issue, see FFF’s award-winning book Separating School & State: How to Liberate America’s Families by Sheldon Richman. om and from Full Context. Send him email. IAHE Action is funded by the donations of our generous supporters. 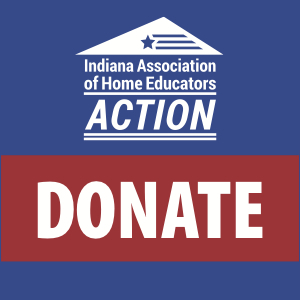 As a 501c4 organization, donations to IAHE Action are NOT tax deductible. Like to see him go after the Atlas Network …450 global non-profits promoting ‘free market enterprises”…??? sounds more like the Humanist Manifesto article 14…all will be non-profit…no private property and no for-profit businesses. It is NOT ‘free market’ when the public pocketbook is open for the pickpocketing including non-profits getting their place in the Prussian road to capitalism. See Frederic Bastiat on this…as well as Lord Acton…and Norm Davies…or just go study The Hebrew Scriptures…Solomon and the Prince of Tyre…controlling the sea lane…and the commerce routes…at the expense of the slaves…. 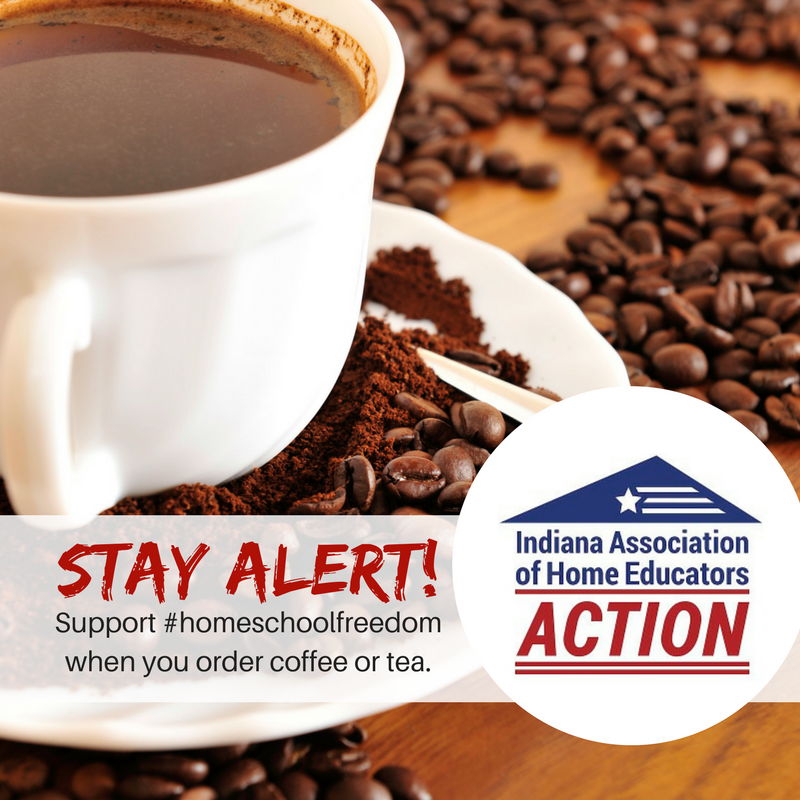 Previous Previous post: Are Indiana’s Proposed Graduation Pathways Problematic for Home Educators?